Shigenori Soejima is the character designer at Atlus, the Japanese video game publisher. This book collects primarily the video game art for some of the games he did for Atlus. They are Persona 3, Persona 3 FES, Persona 3 Portable, Persona 4, Stella Deus and a small section of his non-video game works. Catherine is not included as it came out in 2011. This book is actually the translated edition of the original Japanese book 副島成記 ART WORKS 2004-2010 that was published in 2010. The difference here is there's no translucent dust jacket. The illustrations are beautiful. I like the manga style, the line work and the colours. The interview actually explains the difference between anime and manga style, such as the use of cast shadows instead of tone shades. The coloured illustrations are all printed full page while the opposite pages are mostly wasted white space by printing the accompanying line art at only quarter page size. There are several two-page artworks that are quite difficult to see because they are printed across the gutter. One rather good piece is split at the character's nose. The lengthy interview is a good read. Shigenori Soejima talks about how he got started drawing, the influences he has, design concepts, and all the other work he did at Atlus that were not published. He actually contributed to a lot of games but only those that had artwork are included in this book. 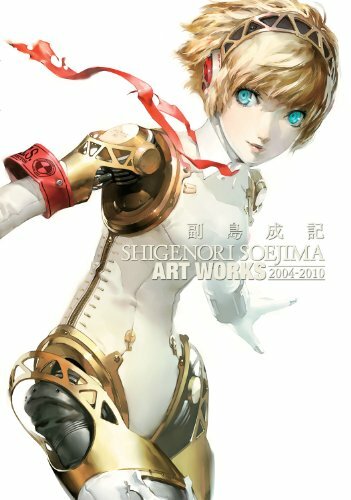 Much of the work in the book were actually collected in other Japanese art books dedicated to the games themselves, such as ペルソナ3 公式設定資料集 (Persona 3 Official Design Works) and ペルソナ4 公式設定画集 (Persona 4 Official Design Works), both which Udon will also be translating. The duplication is extensive. So, you can either get two of the video game art books, or just this book.